The Windows taskbar was introduced with Windows 95 and has functioned as a launching application as well as a place to store and access minimized or hidden windows. But through all it’s following iterations it never really changed. Meanwhile other OS developers were introducing fancy new features like application docking and taskbar customization and Windows users started looking to 3rd party applications like Rocketdock to get the features they wanted. The most useful new feature of the taskbar is that you can now drag and drop any item, whether a shortcut, a folder or even a file, onto it for easy access. And whereas in the older versions the quicklaunch icons were separated from the actual running app icons, they are now one and the same. In practical terms this means when you launch an application already docked on the taskbar it gets highligted rather than duplicated. And if yo launch several windows (or in the case of most browsers several tabs) they stack one behind the other to give you access to all of them at the same time. The same goes for file folders and documents. Additionally you can move and reorganize any and all items on the taskbar in any way you want even when they are open. 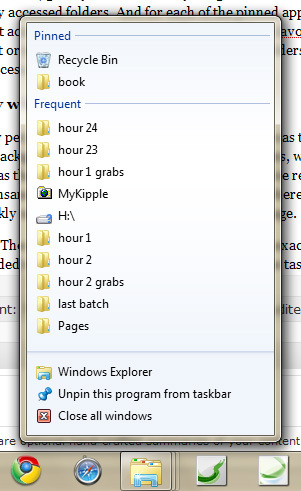 If you have multiple windows or folders open at the same time it can be tricky to remember which one contains which item. To abolish this problem the taskbar has a new feature called Peek. Like the name suggests it gives you a peek of the opened content when you hover over the different active icons providing a preview and full access to all the options without actually having to open them. Peek manifests itself like a bigger taskbar with preview images of each of the open windows, tabs, files or folders and when you hover your mouse over each of them, the full window gets switched to the object in question giving you a quick preview. When I’m writing I usually have multiple browser tabs, three or four folders and at least two or three Word documents open at the same time and this feature makes it infinitely easier for me to find what I’m looking for rather than having to Alt+Tab my way through all the opened elements. In addition to simply launching and previewing open applications, the taskbar gives you enhanced and program-specific functionality at the click of the right mouse button. This activates a pop-up menu which, depending on the icon in question, gives you a list of everything from bookmarked or pinned pages to recently viewed documents and frequently accessed folders. And for each of the pinned applications you can pin sub-elements directly to the taskbar for instant access. In practical terms it functions like a favourites list for all your applications allowing you to pin important or useful documents, graphics, web sites, folders, videos, projects, whatevers directly to the taskbar for instant access. One of my pet peeves with the taskbar in XP and Vista was the section that is supposed to give you information about running background applications such as virus scanners, wireless status, audio, video etc. My big problem with this feature was that everything and it’s seccond cousin twice removed wanted to get top billing in the bar and as a result I had this insanely annoying accordion thing going on where I needed to hit a button to make all the icons appear and then quickly navigate to the right one to make my change. No more! 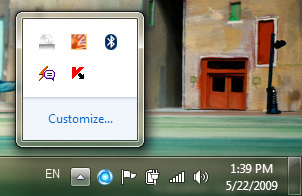 The new Windows 7 task bar lets you decide exactly what icons to display and what icons to ignore. And you are provided with two levels of access: The icons on the taskbar itself and the icons in a pop-up menu that can be accessed from a button. With these two features you can hand pick what application icons you want to see and which ones you don’t care about. And as with the other applications you can reorganize the icons in any way you want giving you full control over your workspace. the interface of Windows 7 is great but in my opinion Windows XP is still a very solid and stable operating system. Right now, I would never give up XP for Windows 7. So this is one of the justifications for Windows 7 is it? Lets consider that even with a modern machine you are going to have to donate much of your system resources if you want all the “bling” 7 offers. Have we really reached a point where computer users are more interested in flashy visuals than functionality when talking about an OS? I hope not. COMPIZ has been offering “bling” for a long time. Linux system requirements are low and if you wanted to I bet you could get a 4 year old PC running Linux/compiz and looking “flashier” (or just as much so) as Windows 7. Difference being Linux is free. I think even the casual computer user has become more aware of their surroundings. Sure even Vista could look pretty but try and find many “average users” that actually liked it. Maybe this has been MS’s problem all along, add the bling and bloat to the detriment of the end user because they can always upgrade their machine. An OS should be a platform in which to launch other software. It should not apply a “CPU tax” prior to you even running anything, that to me makes no sense and maybe explains why some Windows binaries run faster through Wine/Linux than they do through native Windows. XPM mode on 7? Even if you have the modern chipset you are not getting DX compat and thats forgetting that allegedly XPM is only available in the more expensive versions of 7. Windows 7 (and Vista) in my opinion try to be “Jack of all trades, one size fits all” unfortunately with the advent of Iphones, Blackberries and talk of a Google OS users are not frightened anymore to rely on something that doesnt have the Microsoft brand name. Look at the increase in popularity of Linux and the fact that even Microsoft is donating code to the Kernel. I could go on, I won’t. Fact is Microsoft want to sell people 7 (IMO) unfortunately I can’t see any compelling reason for users to leave XP. Its funny how the same things appeared to be said about Vista at its launch. We all know the Vista “issues” and even the MS Faithful were saying “Vista is loved”. That was until 7 was due to come out. In my opinion Vista users are the only people who should either consider upgrading or switch to another OS..those poor souls and I take my hat off to anyone who has been a Vista user since its release. There are a lot of reasons to upgrade from XP to Windows 7, and the “bling” as you call it is way down on the bottom of that list. Quite frankly I couldn’t care less about how the OS works as long as it works well. Windows 7 comes with a huge heap of major improvements that make it a lot easier to work with. I’ve been running the new OS in various renditions since March 2009 and when I had to work on an XP machine the other day it was driving me absolutely crazy. I’ve gotten so used to having everything at my fingertips – from cutom Libraries that give me direct access to only the files and folders I want with minimal browsing to the taskbar that only contains what I want it to contain it’s just more effective. What I find more interesting though is that it runs better, cooler and faster on my computers – including some old and crappy XP-based laptops that technically shouldn’t be able to run Windows 7 at all. It’s breathed new life into our old Toshiba M100 that we thought was lost for good. Not only has the battery life improved (from 1 minute to about 10) but startup, shutdown are faster and hibernation works properly. And maybe most interesting of all, the laptop works the way it’s supposed to without any custom driver installs at all. Installing clean XP and Vista on the same laptop was a 3 hour process with endless driver installs from Toshiba. With Windows 7 the generic drivers just worked right out of the gate with no problems. A side note: If I could I would run Linux on all my computers. Unfortunately my work requires that I run Illustrator, PhotoShop, Premiere Pro, After Effects, Expression Web etc etc all the time – mostly together. And none of these work well under Linux without massive emulation software draining my resources. The day Adobe releases fully working and par performance versions of their Creative Suite for Linux I’ll probably switch back. But that day is way into the future. So until then I’m going to rest comfortably knowing my Windows 7 computers work just fine.